Attention middle grade readers! Here is an opportunity to get directly involved in the publication of your next middle grade read. But hurry, voting ends SOON! A DRAGON’S TREASURE. A GREEDY KING. ONE BOY CAN RESTORE BALANCE BEFORE THE MOUNTAIN IMPLODES. Seamus’s day couldn’t get any worse. His best friend stops speaking to him, his cross-country coach benches him, and lightning strikes him down, right in front of his middle school. But it does get worse. When he wakes up from the lightning, he finds himself trapped in the body of a young squire in medieval Scotland. At the base of a haunting mountain, a tyrannical king leads Seamus and a group of soldiers to face off with a dragon. When a knight who seems eerily familiar is wounded, Seamus is the only one who can find the cure deep within the dragon’s lair. As he approaches the cure, the terrifying dragon traps Seamus and has a chance to end his life. But the dragon spares him, saying that the young squire is on a quest that could change the world forever. Seamus learns he must make a dangerous pact with new allies in order to save his friends’ life and secure one last chance to get home. If you like Eragon and How to Train your Dragon then you’ll love Rose-Marie Lyttle’s incredible adventure for kids ages 9-14. 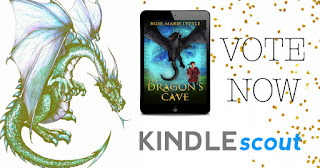 Nominate The Dragon’s Cave on Kindle Scout today. Rose-Marie Lyttle is a USA Today bestselling and award-winning author under another penname. As Rose-Marie, she writes middle grade and young adult fantasy novels. She is also a contemporary dance teacher, Feldenkrais Practitioner(R), energy worker and mom to two lights who shine up her world. She splits her time between Tucson, AZ and Taos, NM. I voted. Good luck to Rose-Marie. So glad you saw it on time. Thanks, Beverly! Ooh! I love stories that transport you. Very cool. This book sounds delightful! Good luck, Rose-Marie! Kai,Thank you so much for having me on your blog and helping me to drum up support!!! Glad you could visit. Best of luck! !